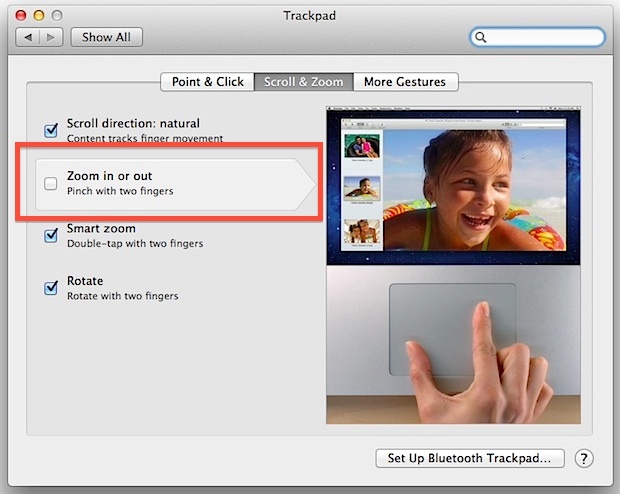 The pinch to zoom gesture is one of those features borrowed from iOS that has since come to the Mac OS X platform. It’s a natural fit for iOS and even in some places within OS X, but it’s also much easier to accidentally activate on the Mac when doing something simple like browsing the web. All it takes is an extra finger or thumb on the trackpad and the zoom is accidentally enabled, which can have a strange effect of causing a Safari window to lock up with all text and images in a frozen blurred state, or at best you’ll wind up looking at some overview of your active tabs and windows in Safari, which is still frequently activated accidentally. This can be very annoying, and several people I know have interpreted this inadvertent zoom activation as the Safari browser freezing, or as some bad plugin, and it can be frustrating enough that some will want to disable the pinch gestures in Safari entirely. Changes take effect immediately, when satisfied just quit out of System Preferences. Unfortunately when you turn off pinch to zoom it is system wide, meaning you will lose the gesture elsewhere in OS X in addition to apps like Safari, where it functions as a zoom tool. Without the gesture, you can still zoom into webpages by using the traditional keyboard shortcuts, and you can still use the two-finger screen zoom as well, which is activated with a scrolling motion and hot key. Of course, you can always turn the pinch & spread zooming abilities back on by going back into System Preferences, and re-checking the appropriate box next to “Zoom in or out”. Changes take effect immediately when reenabling as well. The defaults approach still applies to the entire Mac OS X experience. Know of a way to simply disable the zoom gestures in Safari but not system wide on the Mac? Do let us know in the comments! Hallelujah! Thank you! I hate pinch to zoom, it activates constantly on a Mac trackpad and never when you want it to. The most annoying gesture by far! Thanks for showing how to turn this off. I know you can use BetterTouchTool to edit Safari specifically and prevent it there, but it’s so awful I turn it off system wide. Apple needs to give us a choice on how to activate this awful thing, three fingers instead of two, since two is required for right-click and for moving and clicking. Bad UX from Apple. 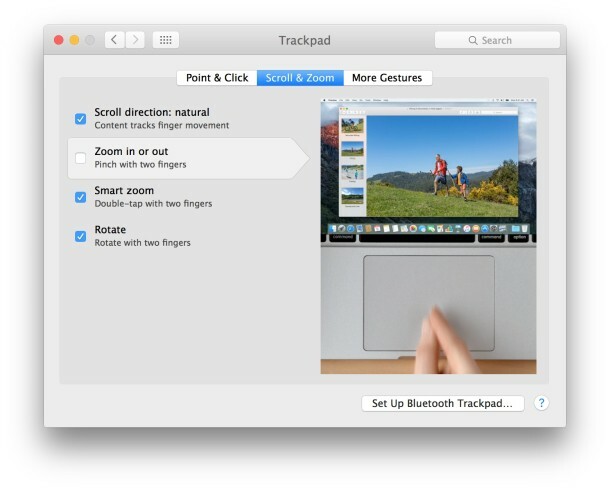 I found the Pinch to Zoom feature to activate much easier with the new trackpads on new Macs. This is annoying, I agree. Thanks. I turned it off because I keep accidentally activating it as well.